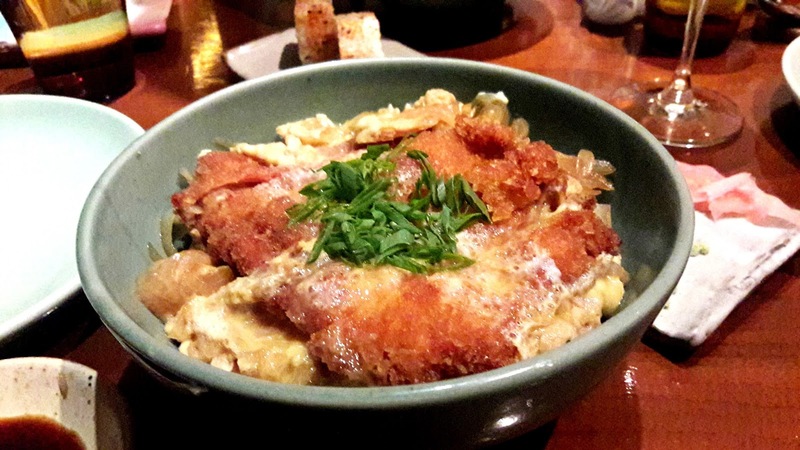 Donburi is both a dish and the bowl it is served in. The contents of a donburi have fat grains of Japanese rice at the base and toppings that range from chicken to seafood to vegetables to egg. A delicious sauce that the meat is cooked in is poured over to moisten the rice. It's the equivalent of a one-dish meal, or as Chef Shohei explained to a friend, the Japanese version of biryani!! 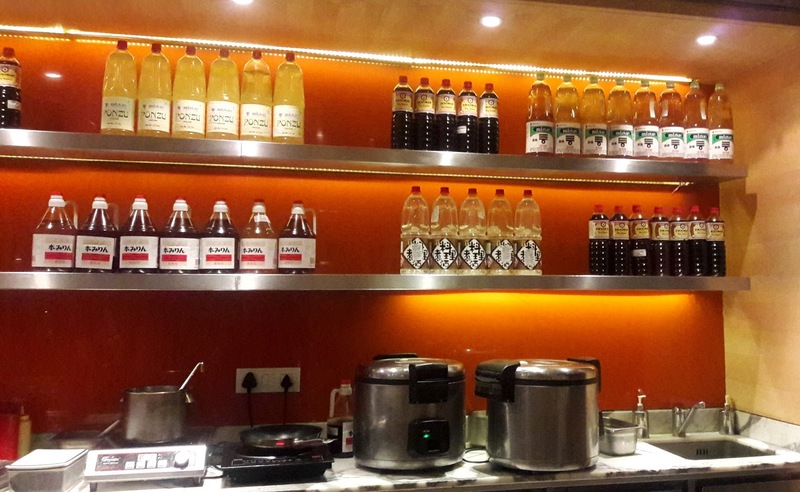 Yakiniku at Hyatt Regency Chennai is celebrating its first ever Japanese food festival, Donburi. The kimono-clad hostess welcomed us into the tiny restaurant. Bottles of Kikoman, mirin and other sauces lined the shelves beside the food prep counter. Chef Shohei, the expat Japanese chef was clearly at ease at his work station. He's also learning Indian customs, greeting us with a namaste! This dinner was all about rice but still, how can you go to a Japanese restaurant and not order sushi? That's how a platter of yasai kakiage maki landed on the table. Sushi rice is spread over nori, the sheet flipped over and strips of vegetables fried in tempura batter are placed over it, rolled and coated in roe. Served with soy, pickled ginger and wasabi, it's light, crunchy and delish! Five kinds of donburi are on the festival menu, including unagi don that has eel. We started with seafood donburi. 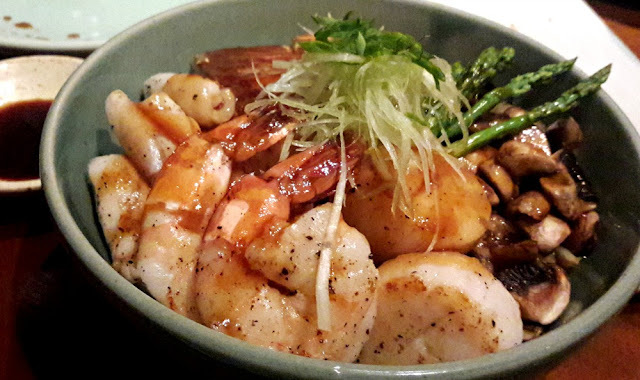 Plump scallops, huge prawns, chunks of pink of salmon, squid, mushrooms and asparagus were beautifully arranged over the bowl of rice. All the seafood had been grilled, taken off the heat at just the right time so each of them was perfectly cooked, yet retaining succulence. The delicate seafood flavours were in contrast to the heft of the garlic-flavoured sauce, balanced beautifully with mirin and soy. Thinly shredded leeks formed the garnish. The katsudon at Yakiniku is not pork but breaded fillets of chicken. Topped with just cooked eggs, the meat was tender but insufficient sauce made the rice a tad dry. Still, it was flavoursome. 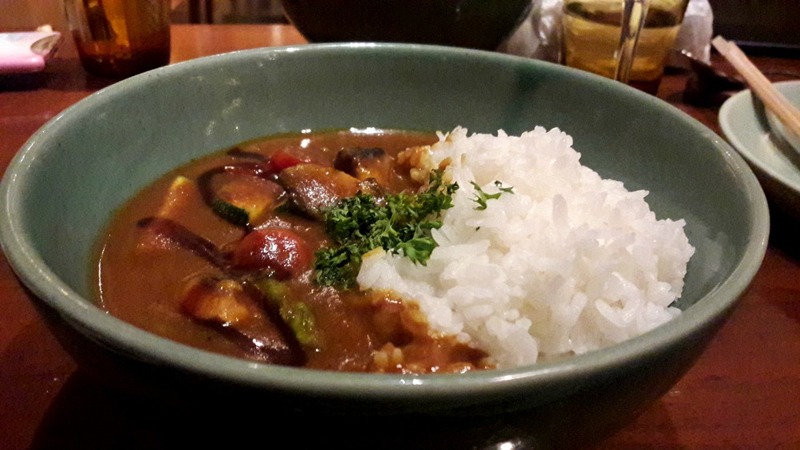 The Japanese are very fond of curry, curry don is also on the menu! The curry has a thick texture, probably a bit of roux was mixed into the curry sauce. The usual curry powder ingredients - coriander, turmeric, chilli and cumin formed the base and the vegetables comprised asparagus, mushroom and zucchini. This one certainly is an interesting vegetarian combination. 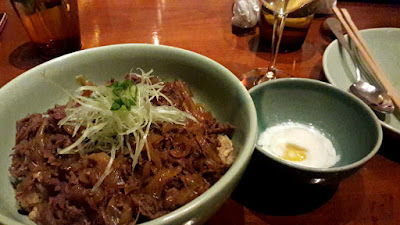 Thin slices of beef cooked with onions and served on rice is gyudon. A poached egg is served on the side, they'll place it on the meat as that is how it is served. Thank goodness as half-cooked egg is not something I can bring myself to eat. The meat was very tender, the hit of garlic was once again obvious and the sauce with mirin, dashi and soy was deep, dark and delicious. Dessert was coffee jelly. Presentation was almost Zen-like until you dig in and the jelly reveals itself - dark, very strong, aromatic yet bitter. 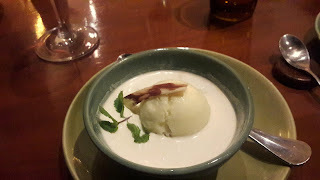 Both the cream and ice cream that it is served with cut through the bitterness, leaving a wonderful sweetness on the palate. If you thought Japanese cuisine was only about sushi and sashimi, a bowl of donburi will show you that it isn't. It is definitely comfort food, wholesome and nourishing and the portion per bowl is plenty for one person. The Donburi Festival is on till November 20th, 2016, prices for a bowl range from 800/++ to 1800/++.